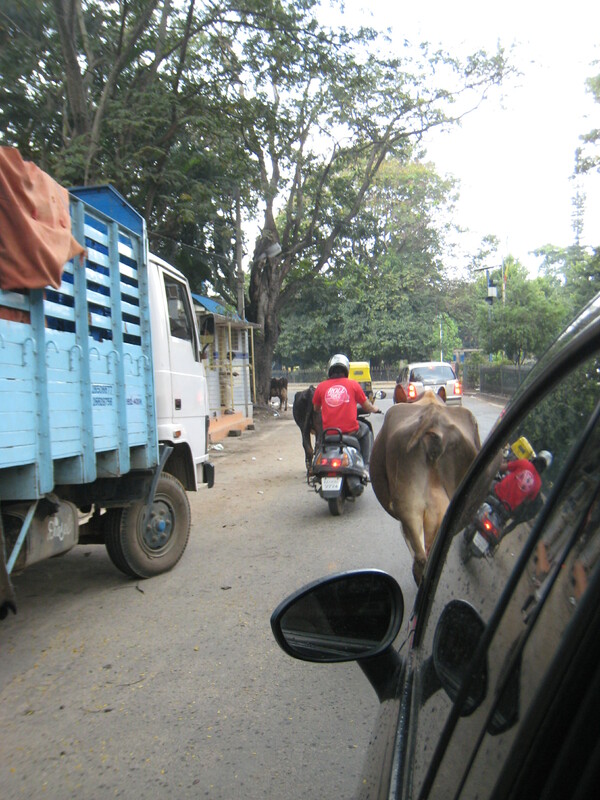 Some of my first observations is there is cars/mopeds, people, cows, everywhere! The honking of the horns while driving definitely doesn’t resound for a nice relaxing drive to work. Every truck has painted on the back, “Sound Horn OK”. I ventured out the first day to a couple of shops. I went to the Lalbagh Botanical Gardens, which I learned Bangalore is nicknames the Garden City and has many parks. At first he pulled over to the side of the road by the garden and I thought I was supposed to jump out. But my driver said, “No Mam, I will go with you, I will keep the dogs away and keep you safe”. This made me a little relieved given there was many people around in the park since it was a holiday. The traffic is crazy – I can’t get over how there isn’t actually seem to be a lot of sense of order. It seems literally they just fit in their Rickshaw, car, moped wherever they can. A 2 lane road in the US becomes about a 5 lane road here of mopeds, rickshaws, and cars. I am actually very glad there are speed bumps built in their roads! – as when they do drive very fast, at least they have to slow down for there! Each driver just lays on the horn for someone to get out of their way. First day at work! I arrived in Tower C, RMZ Infinity building and went to the 4th floor there. It had my name on the board for welcoming me on the TV screen. 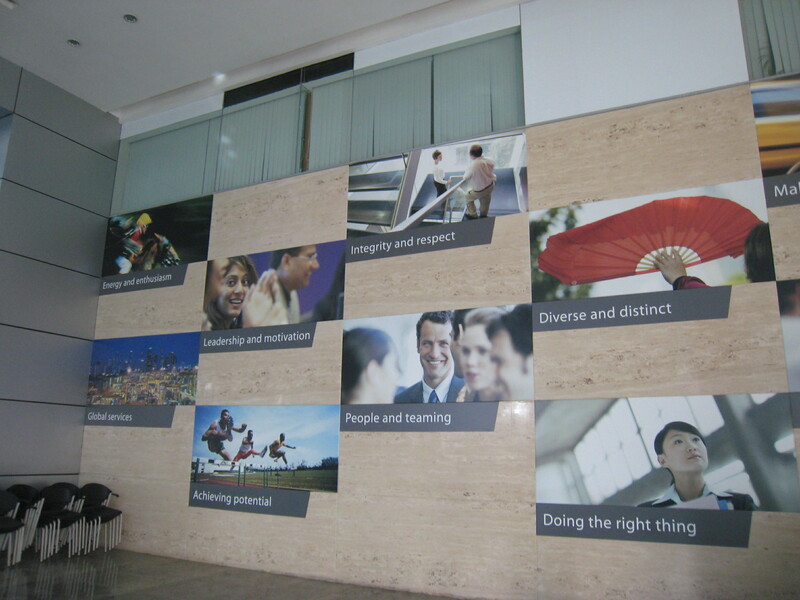 It was nice office and looked similar to other office, same branding pictures, integrity, enthusiasm, courage to lead…etc. 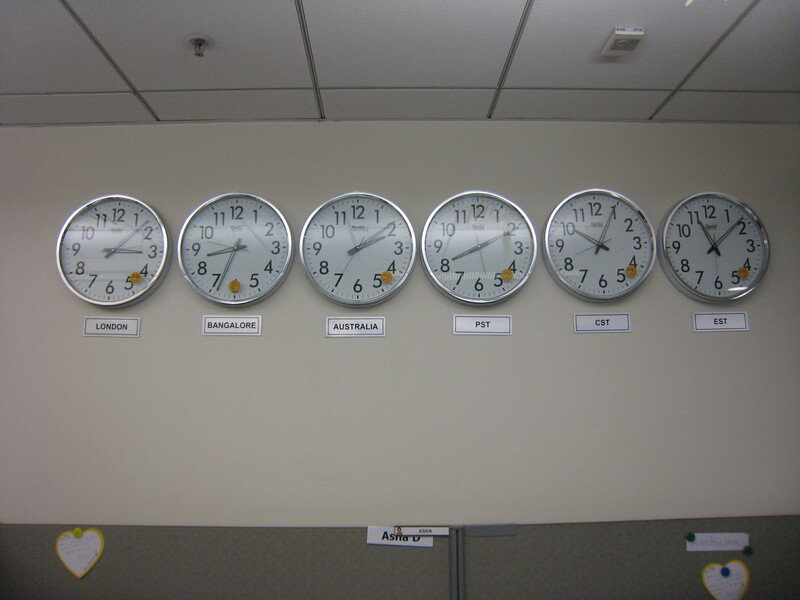 The other nice thing about the office is virtually everything is the same…one firm. To print, I went to global self help just like in my own office, wireless connect same connection, phones exactly the same, etc. I sat there for a bit and they took me to a conference room. There were 2 other rotators from NY that also are here, one Senior 2 and another Senior 3. One is in Banking and one in asset management. We met 2 other rotators that were also here, one from UK, Scotland office and another from Cayman Island office. We sat in a conference room for half the day since they were looking for a desk to put us at. Come to find out there are 385 staff right now on the assurance floor and only 315 spots. They are working on taking down conference rooms and making them cubes. A lot of the staff are sitting 2 per cube and they aren’t too big, so hopefully they get them built soon! Overall in India there are around 5000 in India, so lots located here. This week at work I met with scheduling and got put on several clients. I am working with those teams to facilitate work, quality review, and coach mentor staff. I also taught training on Insurance that they asked me the day before for 5 hour training. The training went well (I think- they didn’t fall asleep!) and many of them asked great questions which also helps to have them participate. It was also nice getting to meet a large group of staff. I came in early in the office (early meaning 8:30) and was about the second one there. A lot come in later in the day since we stay late 8 pm usually since it is easier with time with US clients. Traffic is also very busy between 6:30-7:30, 8 pm, so it’s easier to leave later. Most come in around 9:30/10 since they stay later. 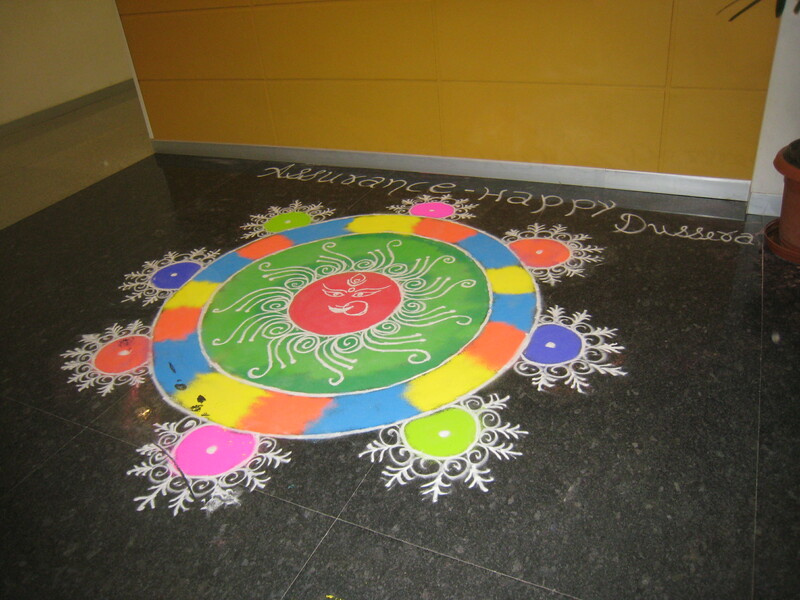 While I got in early to the office, a couple girls decorated the entryway of the office for Dussehra. See design below! All the women dress in traditional dress with Kurtas, Salwars, Kameez and Sarees. Since Thursday was a holiday, the women dressed up in traditional dress with beautiful Sarees on. Most of the time they wear tights (covering down to ankles) and Kurtas. The men though don’t usually wear traditional clothes to work and wear more business casual clothing. All the clothing makes the office a very colorful and bright place to work. I love looking at their decorated clothing. Some of the women do wear more western/professional dress clothing, but most in Kurtas and tights. The moral in the office seems to be pretty good and is laid back atmosphere. It seems like nothing is more important than people and family. They have “heart” recognition awards that you can write a note on a heart and send to a staff/employee. 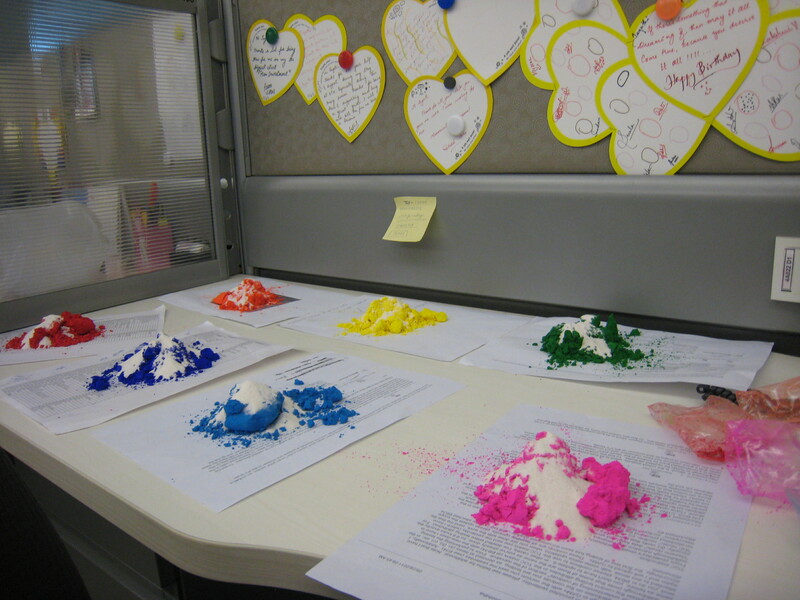 Many cubes have 10-15 hearts hanging up, so is a nice thing to do for colleagues to recognize their efforts. There is also motivational posters hanging from the ceiling, cubes very decorated for birthdays or other events make for a happy work environment. One of the staff’s sisters also came in with her son and was SO cute!! He was walking around the office and had a visit from a 2 year old made my day. Today in the office people also just started clapping, and standing up around a cube area. I asked Pratrima what they were clapping for. She said she wasn’t sure and could be anything. Apparently there was a new senior today and started clapping for her to welcome her. It also happened again later in the day, so happy the people are here. Thursday was a holiday called Dussehra, which I believe is followed by most of India except for Punjab. It is also called Navaratri, which means the nine nights of dancing. During these days, they worship different forms of Shakti/Devi. The 10th day is Dussehra which is the day the office was closed. One of the staff told us about the 9 nights of dancing, however, we didn’t realize to go see it, the last night was on the holiday vs. beginning on the holiday. Each part of India celebrates this holiday a little differently. In South India, people set up steps and place idols on them. I saw this at the restaurant we ate at that week as well as watermelons would be by their doorsteps broken. I wasn’t exactly sure why they did this, but thought probably for protection of home or something. The other thing they did to celebrate Dussehra was get up and wash their vehicles and decorate them with flowers and various other colorful streamers. See the pictures below of colorful decorated rickshaws and trucks! Some I felt I didn’t know how they are even seeing out of the rickshaws they were so decorated! The staff said mostly they just spend time at home with families on this holiday. Others that weren’t from Karnataka We took a day trip to some waterfalls that weren’t that far out of Bangalore. It was fun to, since we got to visit outside of the city. Since the office was closed, we went to some falls outside of Bangalore. After a 2 hour car ride, we had to track across a little boat ride to get to the bus that took us back to the waterfall. I still don’t actually know the name of the waterfall, as I am trying to look it up and don’t see a lot of information on them, but it was fun! The bus we rode was a little rickety! A bunch of locals also were running up to the bus to hop on. Instead, they climbed up top for the ride up to the waterfall. The waterfalls we thought we were going to were Hogenakkal falls which is basically the Niagra Falls of India. We didn’t get to see this, but made it to 2 different waterfalls. Since it was a holiday there were a lot of people coming to the waterfalls and spending their day with families. It’s funny; the women just get in with their sarees and clothes on. I didn’t see any swimsuits at either one of the waterfalls we went to. The men though, wear shorts in the water. The second waterfall we went to was Shivanasamudra Waterfalls. 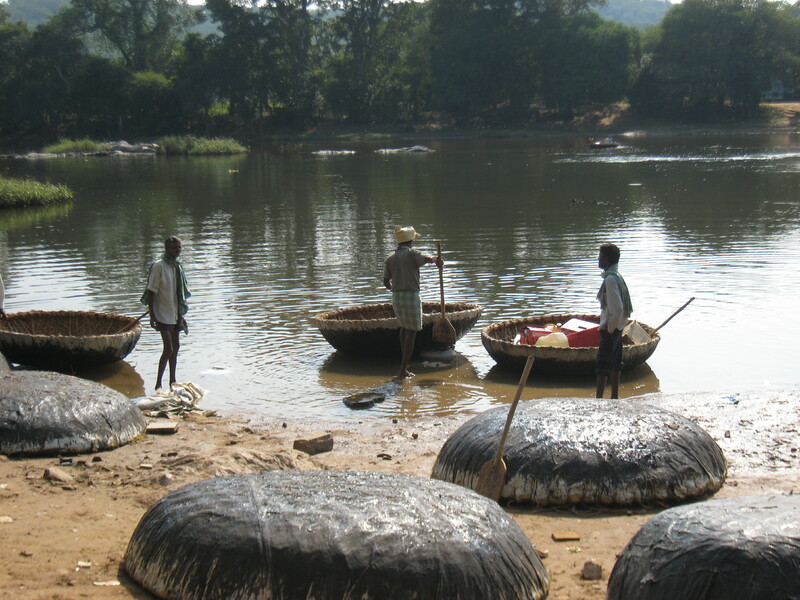 It was around 120 KM from Bangalore. It’s a 200 ft waterfall with 2 main streams know as Gaganachukki, while the eastern stream is Bharachukki. 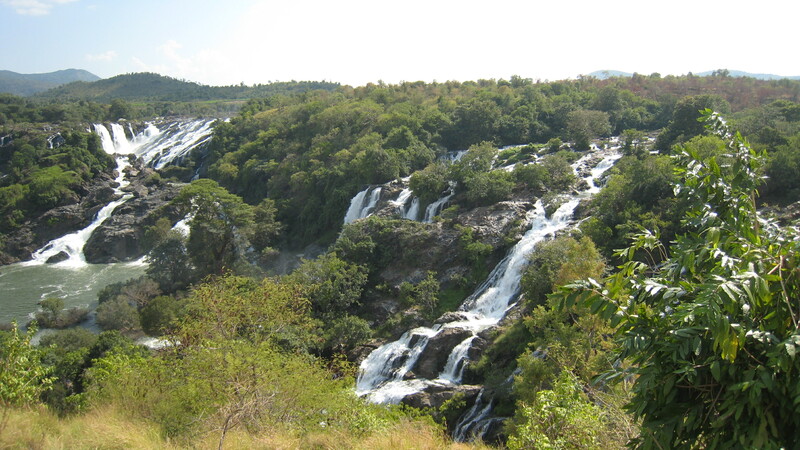 It’s also known as Siva Samudram Waterfalls (a little easier for me to say). Everyone at the office is very nice and caring! For instance, one of the rotators had a death in the family and stayed home at the hotel. A couple guys from the office actually drove to the hotel to go visit her to make sure she was ok. How nice? ! The office has an area downstairs that has different fast food places including McDonalds, Au Bon Pan, Subway, and then handful of multiple Indian food restaurants. McDonalds doesn’t serve anything but Chicken, so if you’re hoping for a Big Mac, you won’t find it here. The chicken wasn’t too good…they use a lot of dark meat here. Wouldn’t recommend Subway either. The Indian places though are very delicious! I just get a little tired of eating rice and rotti and curry each day, but am trying different ones. There is also a ping pong table in one of the pantries, needless to say I haven’t gone in there yet when someone isn’t playing. Right now the office isn’t as busy since there is a new hires starting and get busier with interim work in the next couple weeks. We went bowling Friday night with a few co-workers from work. It was a really good time! The bars here close at 11 PM (quit serving then and close around 11:15/11:30 pm). It’s my kind of city since I don’t like staying out really late! 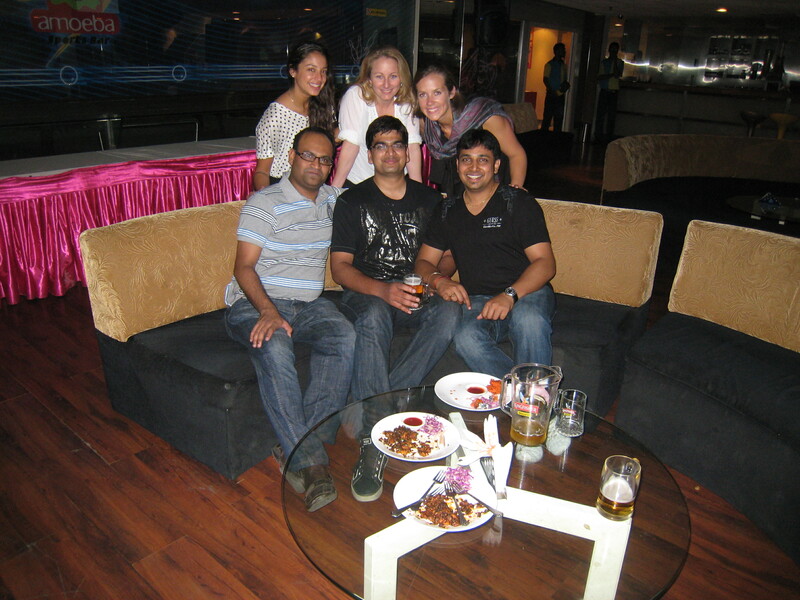 We went bowling at the Leela, which is a very nice hotel that is very near where we are staying. Too bad EY doesn’t put me up there, but I am not complaining my hotel is very nice too.